The “Calf-For-A-Cure” program invites and encourages any and all Nebraskans, regardless of their involvement in the beef industry, to take part in fundraising efforts exclusively supporting cancer research. A donation of $1,000 will buy a feeder calf, this will be combined with other donors to purchase a pen(s) of feeder cattle. A donation of $600 will pay to feed that feeder calf. (The “Calf-For-A Cure” program goal is to purchase 300 head.) The cattle will be placed on feed in a local Southwest Nebraska feedlot. This will allow for the full value of the finished animals by April 2019 to be contributed to the 2019 Cattlemen’s Ball of Nebraska. Because the group values the investments being made in this program, the cattle will be price-protected and insured. All donors will be recognized in the official Cattlemen’s Ball of Nebraska program and will receive a special lanyard to wear during the 2019 Ball event. Ninety percent of the funds raised are given to the Fred & Pamela Buffett Cancer Center in Omaha, Nebraska for cancer research, and the remaining 10% stays in our local communities health organizations. 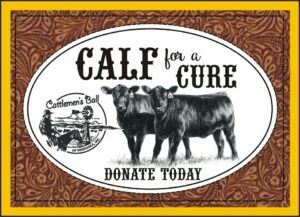 Mail your Calf for a Cure Donation Today!